The global postoperative pain management market is expected to be worth US$ 45,861.8 Mn in 2026, it is projected to increase at a CAGR of 5.1% through 2026. North America was the dominant regional market for postoperative pain management, accounting for US$ 12458.3 Mn in 2017, and is expected to grow at a CAGR of 4.4% over the forecast period (2018–2026). S. FDA is promoting the initiative for abuse-deterrent opioids in the U.S. simultaneously increasing the market opportunity for postoperative pain management market. North America followed by Europe is expected to hold maximum revenue share in the global postoperative pain management market over the forecast period. The companies operating in the postoperative pain management market are focusing on expanding their business in Asia Pacific and China. China is expected to be the fast-growing regional market for postoperative pain management due to increasing number of surgeries and expansion strategy followed by the key manufacturers in the region. The growing awareness regarding reimbursement for postoperative pain management in U.S.is expected to increase the adoption of postoperative pain management in the global market. The demand for postoperative pain management is primarily emanating from countries such as the U.S., Germany, the U.K. and Australia. Increased healthcare expenditure coupled with growing awareness are factors contributing to growing demand for postoperative pain management drugs. The continuously growing population and increasing awareness about the surgical treatments in cancer and other chronic diseases such as chronic obstructive pulmonary disorder (COPD) is expected to impel the demand for postoperative pain management market. Thus, changing healthcare scenario and growing awareness about the postsurgical pain and trauma is expected to increase the awareness about postoperative pain management, and consequently propel the demand for postoperative pain management globally. As per the American Cancer Society, the global incidence of cancer was 14.09 Mn in 2012, where approximately 20–30% out of total cancer patients required to undergo surgery and required postoperative pain management drugs to overcome the pain. By 2030, the global burden of cancer is expected to grow to 21.70 Mn new cancer cases majorly due to growing ageing population. Cancer removal procedures involving mastectomy or lumpectomy require high dosage of postoperative pain management drugs. The growing prevalence of cancer is another factor expected to impel the growth of the postoperative pain management market. As per the International Association for the Study of Pain, the prevalence of postoperative pain in general population is 3–4%. The increasing number of surgical procedures and surgical interventions in various disease conditions is expected to create immense growth opportunities for the postoperative pain management market. According to the WHO modeling of data from member nations, it is estimated that nearly 234.2 million surgical procedures were performed in 2004. Approximately around 60-70% patient experience moderate to severe pain just after 24 hours of surgery. All the patient undergone surgery required to be treated postoperative pain management drugs. The persistently changing lifestyle preferences and choices such as cosmetic reconstruction and plastic surgery is impacting the growth of the postoperative pain management market. Continuous efforts by the manufacturers to develop new non-opioid drugs for global postoperative pain management market is anticipated to fuel competition in the manufactures of postoperative pain management drugs. Geographically, the global postoperative pain management market has been segmented into North America, Latin America, Europe, Europe, Asia-Pacific excluding China, China and Middle East & Africa. North America is assessed to dominate the global postoperative pain management market over the forecast period. 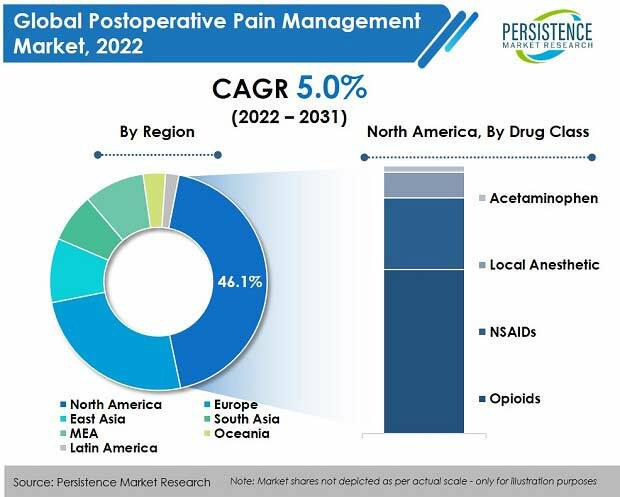 The North America postoperative pain management market is projected to grow at a CAGR of 4.4% over the forecast period to reach a value of US$ 20,580.5 Mn. Well-developed healthcare infrastructure and higher healthcare spending coupled with rising prevalence of cancer and chronic diseases are some of the primary factors expected to drive the growth of the postoperative pain management market in North America. Examples of some of the key players operating in the global postoperative pain management market are Teva Pharmaceutical Industries Ltd., Novartis AG, Allergan plc., Mylan N.V., Pfizer Inc., Purdue Pharma L.P, Janssen Pharmaceuticals, Inc., Endo International plc., Pacira Pharmaceuticals Inc., Egalet Corporation., and GlaxoSmithKline Plc. Key market player such as Purdue is continuously developing abuse deterrent formulation, which offers the manufacturer an edge in postoperative pain management market. The leading players are focusing on development of novel drug delivery system for opioids postoperative pain management drugs and promoting the use of NSAIDs for the treatment of postoperative pain. Some of the companies are focusing on developing abuse deterrent drugs for postoperative pain management. Consequently, extensive efforts by the manufacturers are expected to fuel the competition in the global postoperative pain management market.